Follow the flags! A flag in each garden room introduces you to the Great Mother. 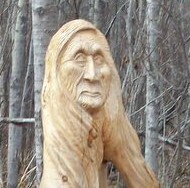 Ancient cultures honoured Earth as Mother. The Great Mother is still honoured by many cultures around the world in recognition that all beings are born of a mother and that cultural continuity depends on the health and well-being of mothers. is the primordial mother of indigenous peoples of the Andes. Her titles include Earth Mother, Cosmic Mother and Mother of Time. She presides over planting and harvesting – an ever present and independent deity who uses her own self-sufficient and creative power to sustain life on this earth. She regenerates new life from death, and thus represents the cycle of life. She sometimes takes the form of a fierce dragon that causes earthquakes. Pachamama’s partner is Pacha Kamaq, the god of the mountain; her children are Inti, the Sun God, and Killa, the Moon Goddess. Pachamama represents the principle of Ayni (reciprocity) and those who nurture mountains, streams and plants are themselves nurtured. 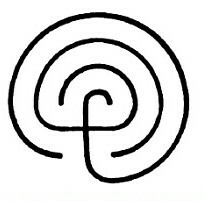 This inter-relatedness is called the ayllu – the biocultural community. Reflect: I am Nature. I am related to all living things in nature. A petroform composed of 16 large rocks laid out in S form surrounds a fissure in the rock where garter snakes hibernate in winter. 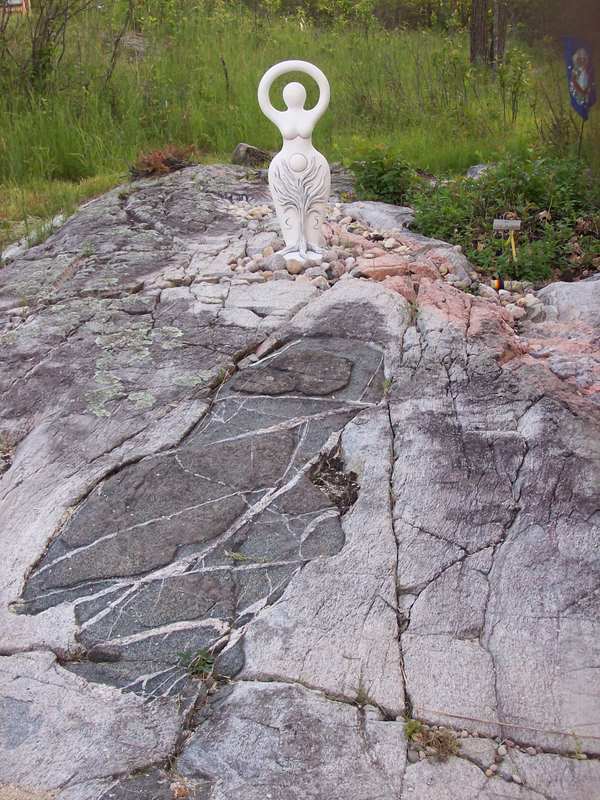 Petroforms are ancient teaching places of the Medewiwin or healing elders. The snake is a universal symbol of healing, transformation and wisdom. She is the Australian aborigines’ mother and creator of all life on earth. From her body the earth and heavens were created. The Jawoyn people of northern Australia tell how the Rainbow Serpent slept under the ground until she awoke in the Dreaming and pushed her way to the surface. She then traveled the land, sleeping when she tired, and left behind her winding tracks and the imprint of her sleeping body. When she had travelled the earth, she returned and called to the frogs to come out, but they were very slow because their bellies were full of water. The Rainbow Serpent tickled their stomachs and when the frogs laughed, the water flowed out of their mouths and filled the tracks and hollows left by the Rainbow Serpent, creating the rivers and lakes. This woke all of the animals and plants, who then followed the Rainbow Serpent across the land. Reflect: How has healing transformed your life? Stand on a rock outcrop and experience The Great Earth Mother who reclines here, her round womb pregnant. See her legs protruding as she rests from her labour. the heart of the Ancient Mother? Notice that both mothers have a sequined sash of purple quartz crystals. 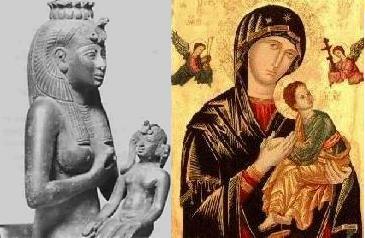 Isis is an Egyptian Mother deity whose titles include Queen of Heaven and Mother of the Gods. She presides from a lion throne and her icons often show her flanked by a pair of lions. The worship of Isis spread to Rome and competed with the new religion of Christianity. Mary – After Rome became Christianized, Mary, mother of Jesus, was elevated to “Mother of God” by the Council of Ephesus in 431 BCE. 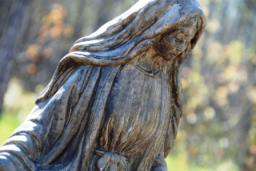 Symbols, titles, icons, festivals and rituals from Isis were ascribed to Mary. You conserve yourself through repeated metamorphosis. I am content to be your child. The Sedna myth emphasizes right relationship with nature and the consequence of causing imbalance to the relationship. Sedna’s father was caught in a storm and chose to save his own life by throwing his daughter overboard into the icy Arctic water. When she clung to the side of the kayak, he cut off her fingers. 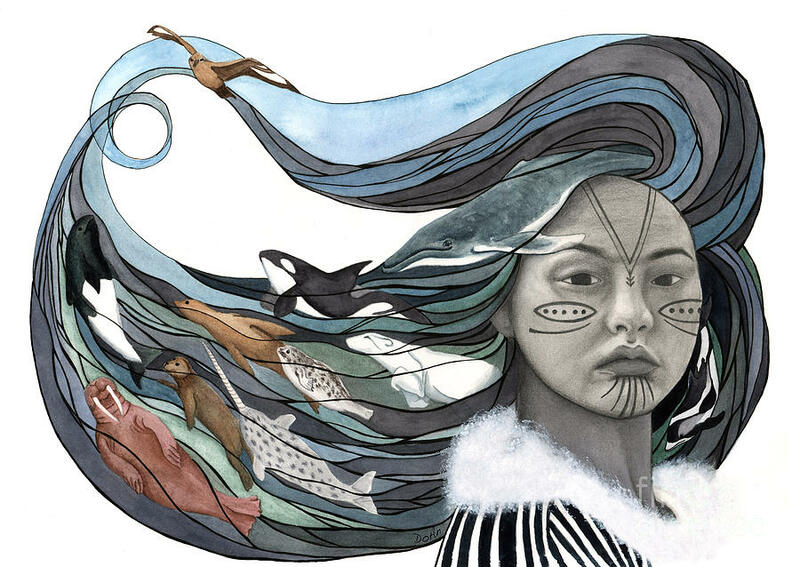 As Sedna’s fingers fell into the sea, they were transformed to sea-animals: whales, walruses, seals, and all types of fish – food for her people. Sedna remained at the bottom of the sea but she avenged her father’s unethical behaviour. If hunters break hunting taboos, Sedna’s hair becomes dirty with the souls of animals who will no longer be released to hunters. Starvation is a potential result if Sedna withholds too many animals. When Sedna’s hair becomes tangled, she becomes irritable because, without fingers, she cannot comb her own hair. She unleashes her anger through storms. A shaman skilled in diplomacy journeys to the underworld on behalf of the comm unity to ease Sedna’s frustration by combing and braiding her hair, thus renewing the community’s relationship with her. When the shaman returns, the community makes a feast to Sedna to celebrate a restored relationship. 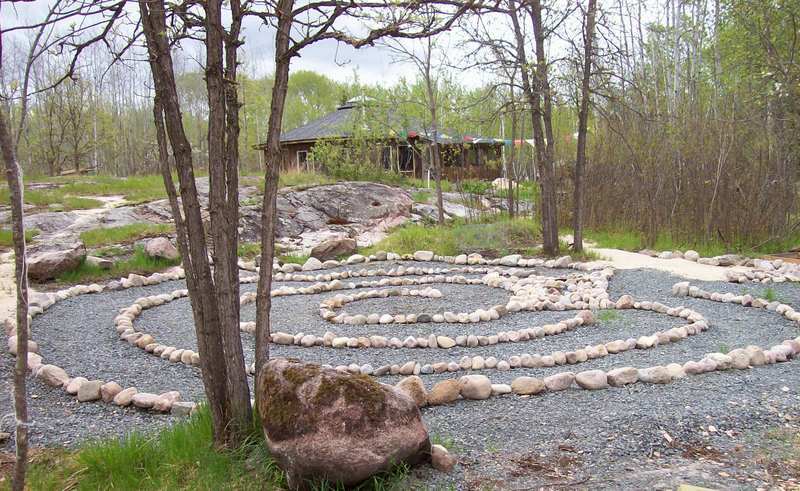 Reflect: How do you maintain a reciprocal relationship with Nature? 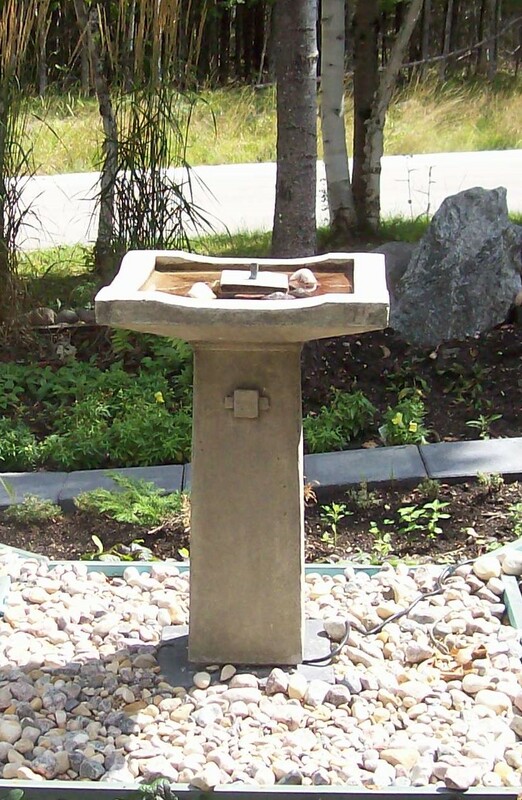 The Cosmos Stone at the centre represents the whole, the One-ness of all things. 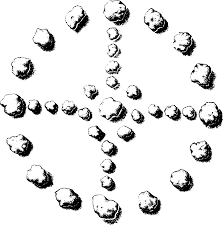 Four stones anchor the 4 directions and represent the elements: Air, Earth, Fire and Water. The stones between the elements are the Teachers. Walk clockwise around the wheel. Receive wisdom gifts from the 12 Teachers. 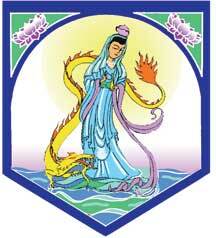 Tara is a female Buddha, an enlightened one was has attained the highest wisdom, capability and compassion. Out of compassion, she continues to take human form and remains in oneness with every living thing. Tara’s titles include She Who Brings Forth Life, The Great Compassionate Mother, The Embodiment of Wisdom, and the Great Protector. Kuan Yin is a Chinese bodhisattva who is considered the personification of compassion and kindness, a mother goddess and patron of mothers. Reflect: how can I offer compassion to Mother Earth as she suffers due to climate change? 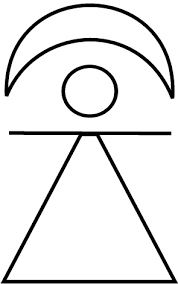 Tanit was the primordial deity of North Africa: the eldest, the mother of all gods. She is the first conscious Act of Creation from the Void and causes creation to begin. Known as the ‘Ever-Ready Shooter’, she uses her bow and arrow to shoot particles of her vitalizing moon fire into infant bodies in the womb. As ‘Opener of the Ways,’ Tanit opened the cosmic pathways so that life could begin and she opens the birth canal so that an infant could be born. 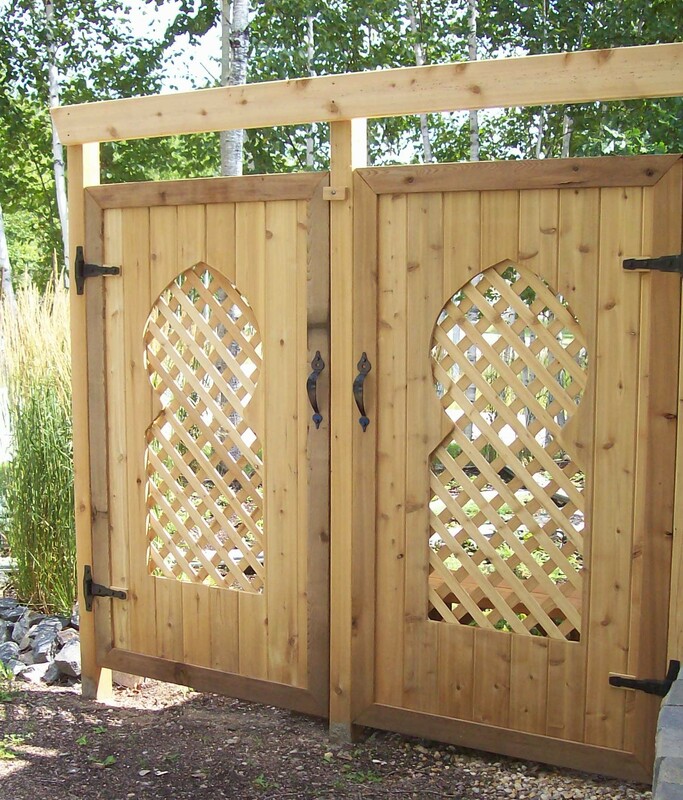 She also opens the gates to the underworld so that deceased souls can find their way. As a moon goddess, Tanit marked the cycles of women’s fertility. She has many names and is known as Tanit, Neith, Athena and Astarte. Reflect: The birth of every being changes the world. How are you changing the world? is a universal tool for contemplation. Walk slowly in silence. If you pass other walkers, acknowledge their journey with a nod and eye contact. As you journey inward, ask your soul what it needs. At the centre, focus on the word or phrase that describes what your soul needs and be grateful for this insight. As you journey outward, ask how you can integrate this insight into daily life.